Hi everybody, it’s James again. To give an update, the lovely Joy is back to researching material again. So, she’ll be back ASAP with a review. If I can guess correctly, I think she may be covering Cadaver Dogs. The name sounds right, but I’ve been wrong before. As far as I go, this is another book review in the Metro Universe. I told you folks that I would cover the main trilogy. And cover I shall. So, here goes nothing. So, fair readers. We welcome you back to some life at the one place we review the Apocalypse. I’ll give the boring details. Joy has had some life issues. I’ve had job issues. Regardless of the issues we’ve had, we’re back! As you can see by the title, we’re going to take a trip down the Moscow Metro. In our minds, that is. And it’s a very dark trip down the Metro. So, let’s set the scene for this book, shall we? Metro 2033 was written by Dmitry Glukhovsky. It was started as a bit of an online experiment in 2002, and the book was originally for free. Well, if you understood Russian Cyrillic, that is. However, let’s not go into those semantics. It took a video game from 4A Studios in the Ukraine to get an official copy in English. Which, on a side note, is very good. Albeit, the game is graphics heavy. The video game helped out, tremendously. But, there are going to be fundamental differences. And for all intents and purposes, this is a book review site. 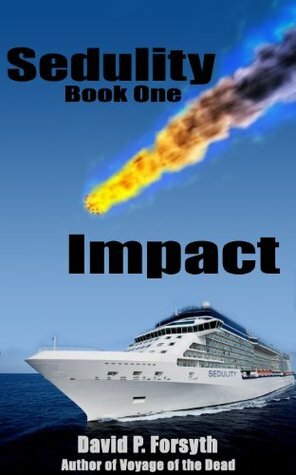 Sedulity Book One-Impact by David P. Forsyth. How do I even begin to put into words what a profound effect this book has had on me. Okay bare with me here folks cause oh boy this is gonna be a tough one for me to put down into words. Sedulity is a second high sea apocalyptic adventure series by author of Voyage of the dead David P. Forsyth. And boy oh boy was this book a powerhouse. The first night I picked it up planning on reading 2-3 chapters and read half the book in one sitting. The second night same story, half of the second half that night. And last night I picked it up thinking to finish it off, only to have the reading accompanied by a legit 5.1 Earthquake here in California were I reside. Boy oh boy did that Earthquake strike home! Now you are most likely asking yourself what does an Earthquake in California have to do with an Apocalypse at sea. Well let me tell you, this book is the beginning of a three part series based around the survivors of a Meteor strike and the catastrophic events that happened after. And man oh man does this book run the gauntlet of catastrophe’s! And the author doesn’t over do it or make it seem unbelievable either. in fact he covers the facts very well, and you will find yourself so thoroughly entrenched in the action you can’t put this book down. I know I struggled to do so. Sedulity follows a well rounded cast of characters, who all have a powerful roll to play with in these pages. From the man who knows what needs to be done for the ship to survive, all the way to the man who is only thinking of himself and what will become of him. Though he covers those thoughts well. When you pick up Sedulity you are in for a roller coaster ride, of emotions, horror, and absolute worry for the characters who star in this tale of the end of the world. Now if you’re still wondering why my Earthquake hit home I’m going to spoil one thing for you, there are several Earthquakes in this story, but only one hits home and is big enough to be terrifying. I just happened to be reading that scene when our Earthquake hit. So this is definitely a book I would recommend to anyone interested in high seas terror, or the apocalypse, or both…both is awesome as well. David P. Forsyth has hit another home run with this book and I for one can not Wait for the next two books in the series. And David informs me they both will be out before the end of the year. YAY! Why do some people find stories depicting the horrific end of civilization appealing? I can’t speak for everyone, but as the author of apocalyptic zombie novels, I have given that question some serious thought. Having grown up with the constant threat of nuclear annihilation, I was always attracted to doomsday books featuring various post-apocalypse survival scenarios. One of the most popular type of apocalyptic themes these days features zombies. Zombies engender feelings of fear and revulsion. A well told zombie tale is full of tension, suspense, and the expectation of violent conflict. Most importantly, zombies are the perfect villains because it is cool to kill them! The audience doesn’t feel sorry for them, at least not after they become zombies. So the reader, or viewer, wants to see them cut to pieces. They want to be exposed to vivid and gratuitous violence inflicted on the undead hordes threatening the vestiges of humanity. We live in a day and age when the impossible has become common place. Technology has changed our lives in ways that we are only beginning to appreciate, making life both easier and more complex. Things like cell phones and cloning were only science fiction when I was a boy. So who’s to say that zombies are impossible? Apocalyptic stories showing how bad life could become also remind us of how far we have come and that the farther our civilization advances, the farther it has to fall in the event of an apocalyptic event. Even those who feel that life has treated them unfairly can relate to a fictional world where their destiny is suddenly up to their own survival drive and ingenuity. Where good and evil are truly black and white. Imagine a world where simply staying alive places you in the top 1%! If that idea is at all appealing to you, then you are a potential fan of apocalyptic fiction and might like the books I write. Legend of Mace By Dan Williams. The final chapter in the Mace of the Apocalypse hits you in the gut, grabs on and doesn’t let go until the end. This book takes place four years after the end of Children of The Apocalypse which I reviewed earlier and if you’ve not read the three prequels yet, why are you hear reading a review of the fourth and final book in a series? The Zombies though are dying off, the Virus that animated them is slowly dying off. But even as one threat dies off, a new one makes itself known as a mass of like minded killers make their way towards the sanctuary that Mace, Jade and all the others call home. You will be sitting on the edge of your seat during this entire book. I had nails when I started, by the time I was done I didn’t. This final edition of the Mace of the Apocalypse series is a page turner, you will not want to put it down until you’re finished with it. I know I couldn’t. This book steps right in stride with the other three novels and even leaves you with a glimmer of hope in the end. Daniel J Williams grew up in the San Francisco Bay area. Some of his favorite activities as a kid included scaring the bejesus out of kids on Halloween, terrorizing neighbors playing doorbell-ditch, and excelling in the ultimate sport of Dodgeball. He somehow managed to score a business degree and wasted years toiling in the business world, writing technical sheets and marketing materials. He finally realized what was missing in his life: Zombies! Spending several years working on his breakthrough novel, Mace of the Apocalypse, he then couldn’t help himself and penned three more novels with the same characters in a continuation of the story. The Mace of the Apocalypse series spans the beginning of a zombie outbreak in San Francisco to its ultimate conclusion in San Antonio, TX. It can be purchased through Amazon.com. 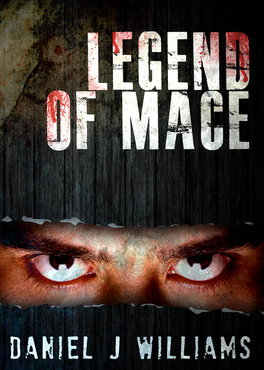 Legend of Mace along with the entire Mace of the Apocalypse series can be found here.